No newcomer to the business, yet a relative unknown among aficionados of power cruisers, Transpacific Marine has quietly been making inroads into North American and global markets. No newcomer to the business, yet a relative unknown among aficionados of power cruisers, Transpacific Marine has quietly been making inroads into North American and global markets. 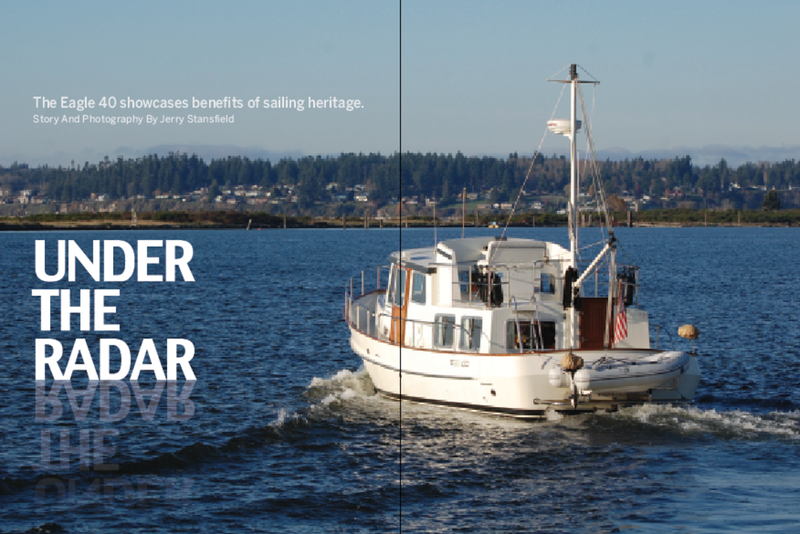 Anchoring the company’s range of Eagle Trawlers is a nifty little 40-foot pilothouse series, a recent example of which was offered by its owners, Roger and Donna Wolthuis, for a close-up inspection tour and trial run out of its berth in Everett, Washington. Transpacific Marine was founded in the mid-1950s and has been in continuous operation ever since. Originally building a limited-production 38-foot wood sailing yacht at its yard in Taipei, Taiwan, the company eventually moved into composite construction, most notably with its popular Transpac 49 center-cockpit ketch (58 units built and delivered). In the late 1970s, Transpacific Marine moved the yard to its present-day site in mainland China at Ningbo, not far from Shanghai, where it now concentrates exclusively on its fleet of power cruisers ranging in length from 40 to 57 feet. Certain benefits seem to accrue to powerboats offered by builders with a background in sailboat design and construction. Apart from their predictably salty appearance (Cheoy Lee’s racy Euro-style Alpha series is a noteworthy exception), these vessels typically feature robust construction, straightforward hull geometry, lots of brightwork, deep fiddles around countertops and shelving, and a variety of other touches that together acknowledge the demands of big-water travel, and the Eagle 40 clearly fits the pattern. In profile, the hull presents a lovely sheer line rising from a subtly curved transom toward a moderately raked bow—its curves repeated in a nearly full-length guard strip halfway down the hullsides; the superstructure is crowned by a flybridge coaming that defines the upper helm station, and a top deck extends sternward over the saloon. For its proportions alone, the boat offers an agreeably classical look, and hints broadly at its extended-range, live-aboard design brief, and the understated traditional styling within. The Eagle 40 measures 14 feet 6 inches in the beam, which is unusually generous compared to other cruisers in this size range, and a primary contributor to the boat’s impressive interior dimensions. The hull form offers few surprises, and features relatively full forward sections with no flare at the bow. A deep forefoot quickly flattens to a modest hard-chine V-bottom that tapers upward to meet the transom just below the waterline, and a full-length keel is fitted with a shoe extension that terminates at a lower bearing for the stainless steel rudder. Construction is solid fiberglass throughout the hull, with a foam and plywood-cored superstructure. Side decks—yet another benefit of the wide-beam design—extend from the foredeck sternward on a single level to the after end of the deckhouse, down two steps to the self-draining cockpit. Waist-high 1-1/4-inch stainless steel railings bolted to nearly knee-high bulwarks ensure secure access around the boat’s perimeter. A stainless steel ladder provides access from the cockpit to the well-instrumented upper helm station. Here, a wide bench seat accommodates two behind the molded wraparound coaming. Just aft on the top deck is room for securing a tender, but in the case of this test boat, and in order to preserve topside space for lounge furnishings, Roger Wolthuis has installed a cradle of his own design on the bolt-on swim platform, placing the tender within easy reach of lifting tackle he has rigged to the mast. Similarly, the cockpit area itself accommodates chairs for socializing at dockside or underway. Port-and-starboard pilothouse doors open directly to boarding gates for immediate access when approaching an alongside tie. 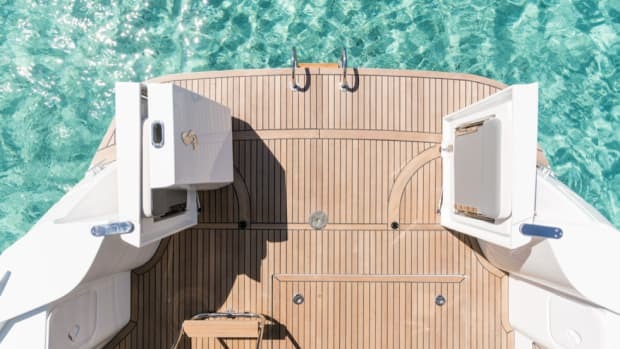 With its definitive pilothouse design, the Eagle 40 features a logical division of spaces that dovetails nicely with the Wolthuis’ cruising lifestyle. “When we’re on board,” says Roger Wolthuis, “we spend about one-third of our time under way, one-third sleeping, and one-third relaxing, entertaining, and eating, and this boat’s layout provides for all three in well-defined, dedicated spaces.” In lieu of an optional two-stateroom arrangement, Roger and Donna selected the standard version with the single forward stateroom featuring an island queen-size berth, drawer and hanging storage arrayed along either hullside, and an adjacent head with a separate stall shower; a portside vestibule area at the foot of the pilothouse stairway offers additional hanging locker and drawer storage. “The majority of our cruising includes just the two of us,” Roger says, “so the single stateroom version fits our needs very well.” The boat’s pilothouse lounge and saloon settee may be converted to accommodate overnight guests, with additional room on a youth-size berth made up from the saloon’s starboard-side banquette. Thanks to this strategically placed side gate, owner Roger Wolthuis steps ashore directly from the pilothouse after easing his boat alongside. Five good-sized view windows—two on each side and one aft—illuminate the saloon, and slide open for cross-ventilation in warm weather. While the standard galley, located forward on the port side, includes a peninsula counter to separate that space from the adjoining dining area just aft, Roger and Donna opted for a more open alternative arrangement with the granite countertop extending along the saloon forward bulkhead, and generous cabinet storage above and below. Appliances on the test boat include a gas oven and cooktop, and an under-the-counter side-by-side fridge-freezer, built into a starboard-side cabinet opposite the galley. A short stairway to starboard of centerline leads up to the pilothouse, where on the port side a raised observation lounge with a refreshment table offers passengers a commanding view through three windshield panes, each fitted with a pantograph wiper. 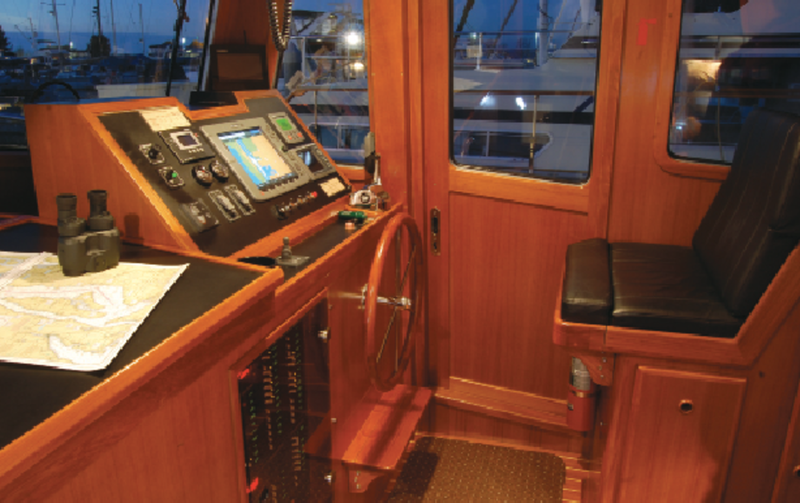 To starboard, the lower helm station features a raised pilot seat facing an instrument console sufficiently large to accommodate requisite navigation displays, engine controls, and electronics, with the ship’s DC panel just below. A large chart table adjacent to the console hinges upward for access to a chart and document storage compartment, and sliding doors open for immediate access to either side deck. Two windows in the pilothouse aft bulkhead offer limited sightlines astern, though the prudent captain will recruit a spotter for help backing in tight quarters. The Wolthuis’ Eagle 40 started as a spec project, originally intended to serve Transpacific Marine as a showpiece of sorts, and accordingly fitted with an impressive array of optional and standard equipment. By the time its eventual owners arrived on the scene, the boat was well on its way to completion, a state of affairs that suited them well, partly because they could take delivery in far less than the nominal build time, but also because the vessel was so thoroughly equipped. 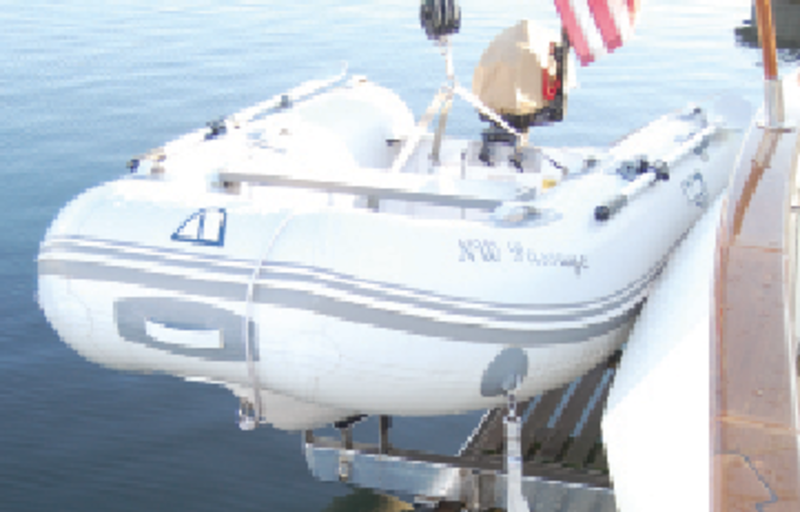 The bolt-on swim platform easily accommodates owner-designed and -installed tender cradle. 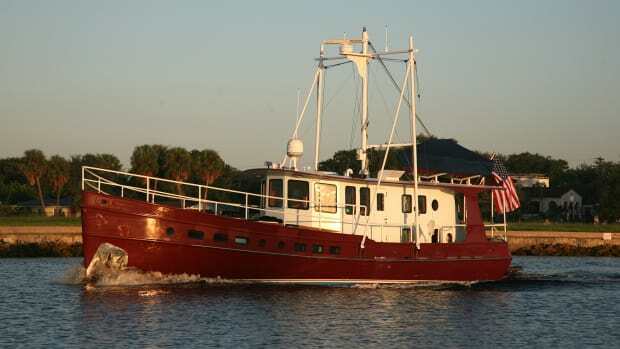 Among the extras: an aluminum mast with boom for tender launch and retrieval, as well as to support the radar antenna; a Vetus electric anchor windlass with foot switches; saltwater washdown system; freshwater hot/cold cockpit shower; every boarding gate imaginable, including two that are aligned with pilothouse doors and one at the transom, in addition to the two standard cockpit side gates. Interior upholstery, moreover, is finished in gleaming black leather, an option that richly complements the finely finished teak interior cabinetry and trim. 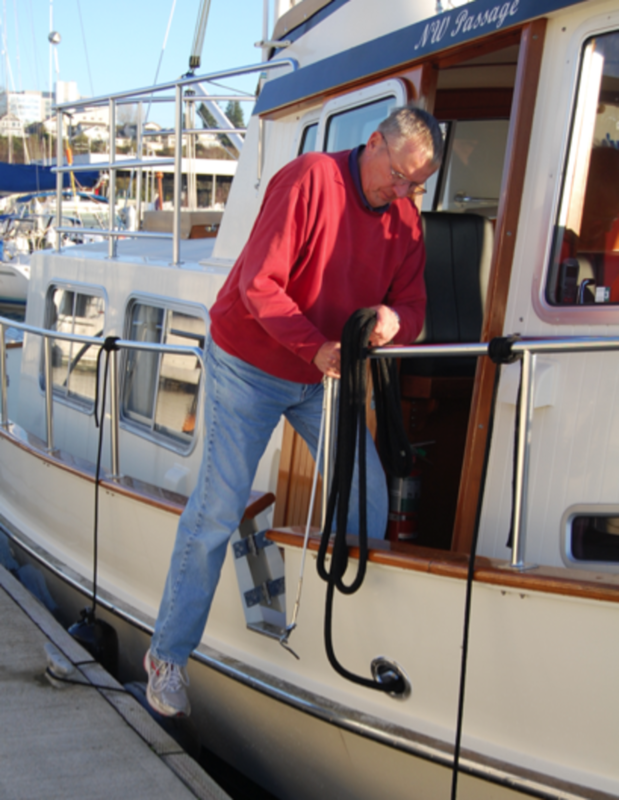 Roger in particular likes the side boarding gates that, aligned as they are to both pilothouse doors, enable him to step easily from lower helm to dock as he eases his boat alongside in an effortless singlehanded docking procedure. 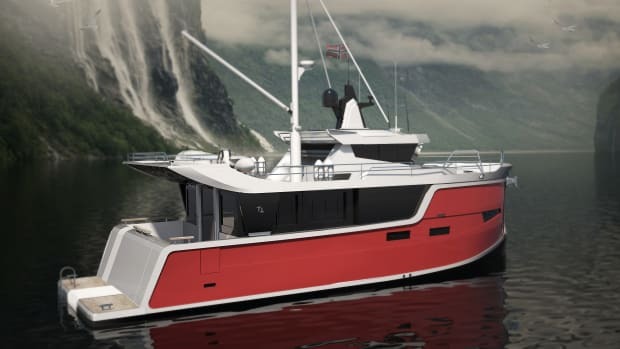 “This is one of the few pilothouse trawlers this size that enable the captain to take the boat out and return to the dock by himself,” he says. It’s worth noting that in the nearly five years since they took delivery of their Eagle 40, Roger and Donna, notwithstanding a busy cruise schedule and more than a thousand hours under way, have maintained their boat in meticulous fashion, with flawlessly varnished brightwork, polished hardware, and a pristine fiberglass finish throughout. Mechanical spaces, lazarette and bilge compartments are spotless—this due in no small measure to the white gelcoat surfaces in all utility spaces. As his boat’s appearance would suggest, Roger adheres to a formal schedule of fluid checks, filter changes, and other maintenance chores—a regimen made easier by two engine room access points, one from the saloon beneath the hinged pilothouse stairway to an area along the main engine’s starboard side, and the other via two hatches in the pilothouse sole. Fixed ladders permit direct entry at either side for inspecting and servicing engine, hydraulics, and fuel and electrical systems throughout the space’s snug confines, without the need to hire a contortionist for the task. 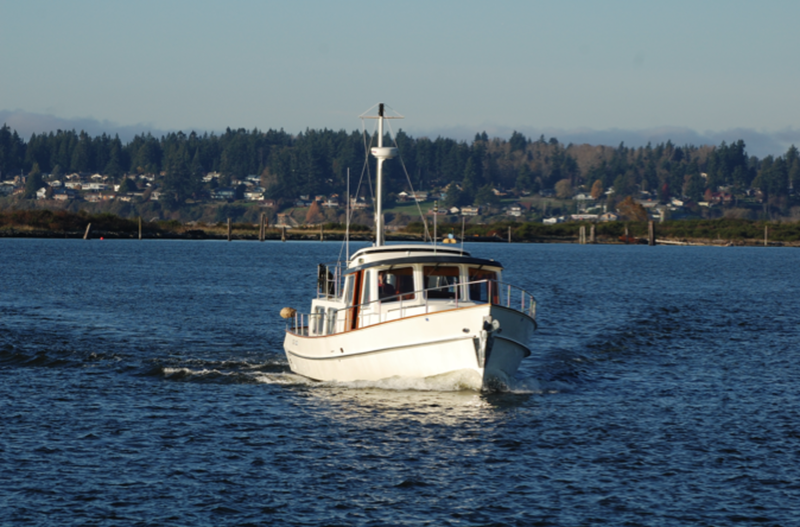 On a rare sunlit November day in the Pacific Northwest, Roger and Donna cast off lines, and their Eagle 40 eased into the lower reaches of the Snohomish River, then into Port Gardner beyond the Everett waterfront for a brief trial run and a demonstration of their boat’s behavior underway. The hard-chine hull felt moderately active in the 1- to 2-foot chop, but not uncomfortably so, and held course well in head, beam, and quartering seas, maintaining a level attitude from idle up through about 2300 rpm, then rising only slightly at the bow as it approached its top speed of 10.8 knots at 2670 turns. 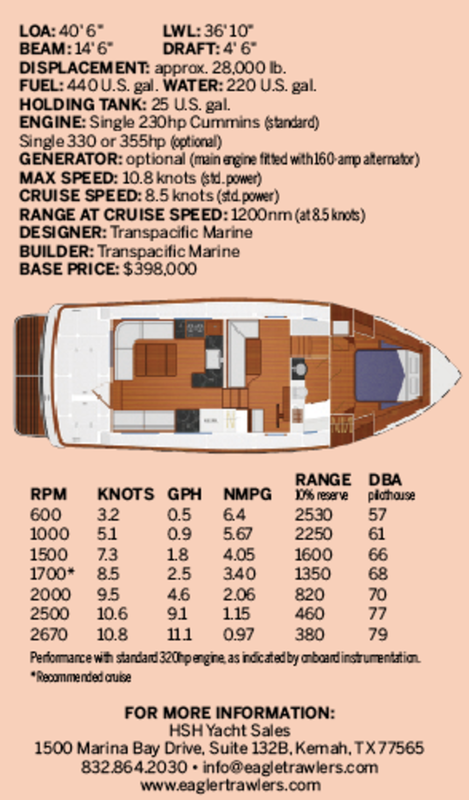 The boat feels especially at home at about 1700 rpm or 8-1/2 knots, holding course well and displaying little, if any, heel through moderately aggressive turns both to port and to starboard. The muffled hum of the single 230hp Cummins QSB diesel allowed normal conversation at cruise speeds, only nearing the 80dBA level at the seldom-used wide-open throttle setting. At maneuvering speed, and without the aid of the bow thruster, the boat can be nudged through a complete pirouette in little more than its own length. For couples and families who prefer well-defined and separate living spaces to the more open arrangements of sedan-style trawlers, Transpacific Marine’s Eagle 40 pilothouse series presents a roomy, nicely equipped and well-built choice. As demonstrated throughout the Wolthuis’ vessel, glasswork, joinery, mechanical installations, wiring, and plumbing appear to be uniformly top notch, and have earned the approval of at least one cruising couple who know their way around a trawler. 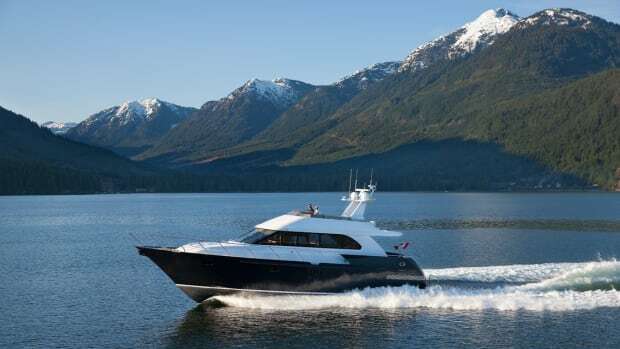 While about half of the nearly 40 units built to date have been sold in the United States, expect the boat and the brand to make yet greater gains in recognition and repute in the coming years. Modern systems and amenities balance the Eagle 40’s classic lines. Robust construction and a long keel give the boat a solid feel underway.